New modul: "Multi-level Illustrated Menu: Show Categories Menu with Pictures"
I represent for you my software development company kinvasoft.com, our team has more than 10 years experience in software development and internet technologies our solutions are used in many countries around the world. 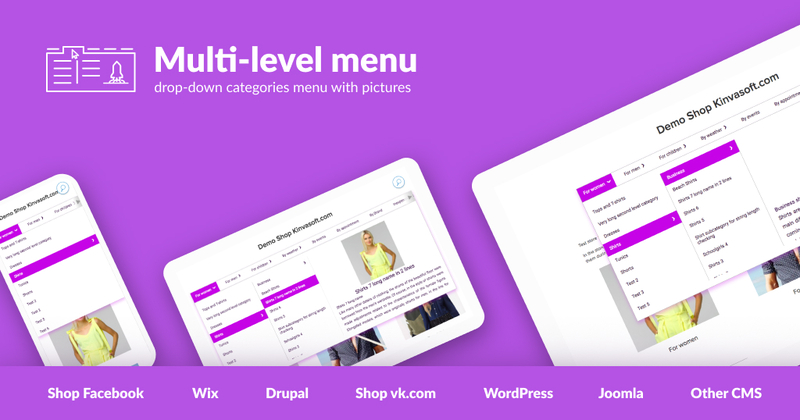 We have released the Multi-level Illustrated Menu: Show Categories Menu with Pictures. It Shows Categories Menu with Pictures - Beautiful and clear drop-down categories menu with pictures. Accelerate the search for goods and their purchase. You can install the app and use 7 days for free! Take the survey (it will take about 3 minutes) (It is more useful for you, because the answers will be structured and you will think less). We will consider every opinion to increase the benefit of the application for you. To start filling out, click on the link. We released a new version 2.0 of the application "Multi-level Illustrated Menu: Show Categories Menu with Pictures». Scroll in the drop-down menu categories. Adjust the height of the drop-down menu area. – on the app page in App Market Ecwid . Last edited by Vasiliy Klimov; 08-05-2018 at 05:31 AM. We released a new version 2.1 of the application "Multi-level Illustrated Menu: Show Categories Menu with Pictures». Enable the menu on certain pages. Setting the width of the arrows to the left and the right to display on the computer. 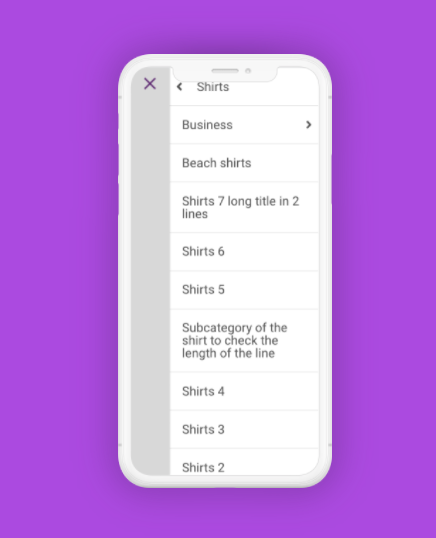 Setting the width of the arrows to the left and the right to display on the mobile. You want to get the app 51 times cheaper, for $1/year? Read the post carefully, it has a bonus. Merry Christmas is coming soon and we decided to give you a gift – "Give the opportunity to buy our app [URL="https://kinvasoft.com/promo/ecwid/multi-level-menu/en/index.html»]Multi-level menu[/URL] for $1/year " although it costs $51/year. Before launching the campaign, we are interested in your opinion ‐ Do you need a promotion? They decided to vote in the social network to make it easier to count. Links to groups will be lower. Voting lasts a week and at the end of the week, we will decide whether to launch the action or not. To start the campaign you need to put 10,000 likes and subscribers in the group. 1. fb for those who speak English. Voting in each social network you increase the chances of launching such an action. Anyone can ask their friends to vote for the launch of the action by placing a post on their wall: “I want the app 51 times cheaper! Help start a campaign that allows me to buy an application for $1/year, and it costs $51/year". 2. Subscribe to or join the group’s newsletter to receive a notification of voting. those. Before the start of the promotion, we will give 4 licenses for free! Voting lasts until December 8, 2018 23:59 UTC+5. Last edited by Vasiliy Klimov; 02-19-2019 at 02:26 PM. 2 variants of the mobile menu. We made three options for adding a menu to a container (Container is the first line in the settings via, which you can select any place on the page where you want to add a menu). Support fontawesome.com replaced the arrows. Redid the mechanism for rendering scrolling. Improved work when scaling when the font size in the menu is increased or decreased. Last edited by Vasiliy Klimov; 02-20-2019 at 04:43 AM. Now you can show site visitors only those product categories that you want to place more emphasis on in the drop-down menu area. Last edited by Vasiliy Klimov; 02-20-2019 at 04:44 AM. You can insert the same menu on different pages with different appearance and list of categories (works when copying the widget code). Last edited by Vasiliy Klimov; 04-16-2019 at 04:59 PM. We plan to release a new application, we decided to make a vote for the functionality. For those who voted, the work of the 1st month of the new application as a gift. Last edited by Vasiliy Klimov; 04-16-2019 at 06:28 PM.